Score Tons of Credit for Inviting Friends to This New Daily Deal Site! 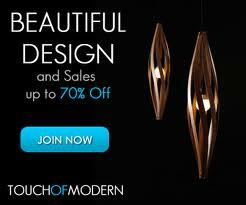 Touch of Modern is a new daily deal site that specializes in home goods such as kitchen items, decor and much more. They have an easy referral system that can score you lots of credit to the site! When 10 friends join the site using your link, you'll get $25 in credit. 25 friends = $50, and 50 friends = $75! So, click here to sign up (it's invitation only), get your link, and tell your friends to sign up to get credit too!